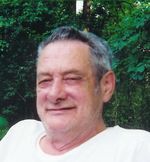 Dennis R. Stacey age 73, of Ashland died Tuesday May 20, 2008 at his residence. He was born in Cleveland on January 24, 1935, the son of the late Stanley and Constence (Bilton) Stacey. Mr. Stacey had resided in Ashland since 1977, he was a plumber for Welsh Plumbing and heating. He was a veteran of the U.S. Army where he served in Korea. Mr. Stacey was a member of the V.F.W., American Legion, AmVets, and the Eagles Club. He was also an avid stamp collector. Mr. Stacey married Gene (Owens) Stacey who preceded him in death. Survivors include two sons Byron Stacey of California, Ricky Stacey of Twinsburg, and his daughter Dee Haas of Ashland. Also surviving are his 6 grandchildren, 4 great grandchildren and his sister Marian Valentine of Berea. A memorial service will be held at 6:00 p.m. on Friday May 23, 2008 at the Heyl Funeral Home with Chaplain Gerald Gess officiating, military honors will be performed by the Ashland Veterans Honor Guard. Friends may visit with the family one hour prior to the service at the funeral home.